downloads, info. 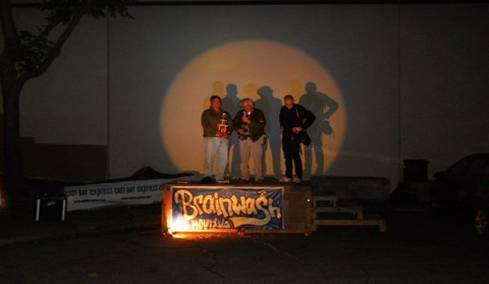 – Brainwash Movie Festival: Drive-in Bike-in Walk-in Film Festival in Oakland, California - unique independent short movies! With a virtual plethora of weird, unusual and just plain great short and feature movies, this year again promises to be worthy of the culmination of over 20 years of fine movies for audience enjoyment and edification from Brainwash. A must see again this year, including movies that will entice, shock the sensibilities and touch your heart. Witness, also, the settings: Nimby, the original DIY industrial art space in Oakland. Contact Shelby Toland: brainwash.movies@gmail.com, 510 836-3210 for more information. The Brainwash Drive-in Bike-in Walk-in Movie Festival. 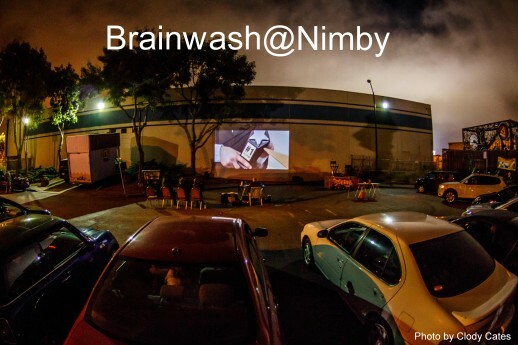 Timelapse photo of the Brainwash Movie festival (please credit Gary Nakamoto). Brainwash Movies’ irascible and (perhaps) mythical founder, Shelby Toland, issues a directive to festivalgoers from onscreen. Executive Producer Duncan Maddux presenting “Brainwash First Feature” award in 2009 (from behind the screen). Repurposed trophies that are actually awarded to moviemakers. Phil Snyder, Dave Krzysik and Jimmie Wing at the Brainwash Movie festival at Nimby. Stylized image of festival with logo.